The newly-elected members of the Student Union executive and Students Representatives Council of the University have been sworn-in. They are: Comrade Kehinde Awosanya, President; Comrade Afusat Ladejobi, Vice-President; Comrade Olalekan Adebulu, General Secretary; Comrade Abiodun Ojediran, Assistant General Secretary; Comrade Rotimi Oladele, Treasurer; Comrade Oladotun Aderibigbe, Financial Secretary; Comrade Olamide Adelusi, Social Secretary; Comrade Modesta Eze, Sports Secretary; Comrade Taofiq Popoola, Welfare Secretary and Comrade Abeeb Oyekunle, Public Relations Officer. In his acceptance speech, Comrade Awosanya said his regime was coming into office with a practical approach to student unionism, adding that members of the new Executive were true representatives of FUNAABites and promised to work in harmony with Management towards consolidating on the achievements of his predecessors. 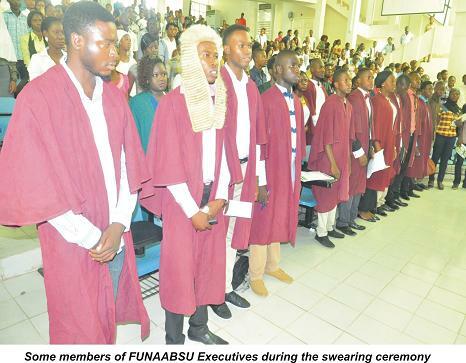 The immediate past President of FUNAABSU, Comrade Temitope Adesipo, on his part, thanked Management for giving him and his team the opportunity to lead the students’ body well, saying the University was fortunate to have Professor Olusola Oyewole as its Vice-Chancellor. He charged the new executive to avoid rancour and in-fighting amongst themselves, if they wish to succeed in office while the Dean of Student Affairs, Professor Yemi Akegbejo-Samsons congratulated the new students’ representatives and wished them success in office. In his remarks, the Vice-Chancellor, Professor Olusola Oyewole, appreciated the immediate past executive members for partnering with Management in a bid to make the University a world-class institution. He urged the new team to carry out their duties with the fear of God; even as he said that student unionism was no longer about hooliganism but a call to responsibility. The Vice-Chancellor advised the students to have a good vision for themselves, thereby adding value to the University community. He urged them to shun cultism and other anti-social vices. He promised to organize a leadership training programme for the new student leaders, to equip them with basic leadership qualities, expectations and goals. Meanwhile, Comrade Awosanya promised a peaceful tenure in office as FUNAABSU President and assured that his administration would employ dialogue to resolve any crisis between the students and Management of the institution, rather than using violent or destructive means. P. Kenny, as fondly called by admirers, promised to give purposeful leadership to all FUNAABites. “As far as I am concerned, I’m going to put in all my best with my team members, to make sure that our names remain an indelible mark in the hearts of all FUNAABites”, he had said.